I'm an indie author sharing her trials, tribulations, and successes. I will also share information I gather as part of my research for my dystopian novels, so you may learn something too! Yesterday, I touched a bit on one of my favorite hobbies, plant identification. I also mentioned how many of the plant photos I take are while walking my pup. Many of my hobbies overlap like this, especially when it comes to the books. Any experience I have that I feel might pertain to my stories goes either into a mental note or into an actual note on my phone. 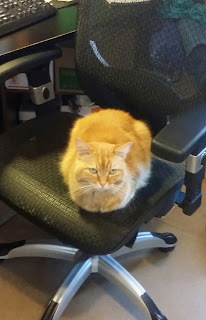 My cat, Lars, "helping" me work. 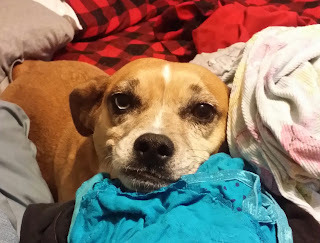 My doggo, Kaylee, "helping" me with laundry. Lars and his BFF, Buddy. 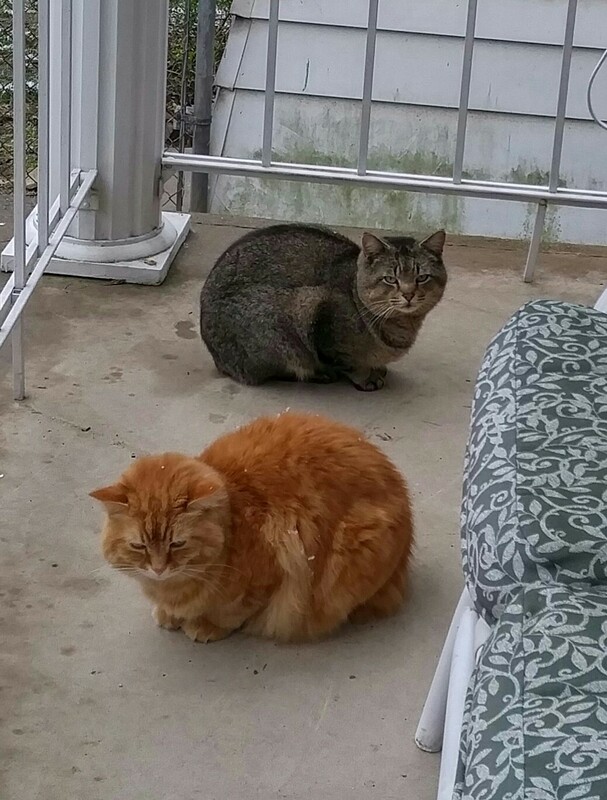 Buddy is a feral cat who lives on my porch, hence the "half" bit. 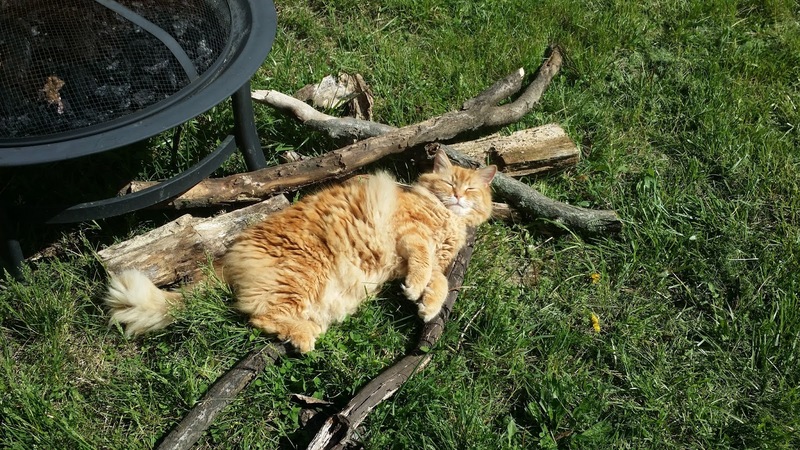 Two autumns ago, he started sleeping on a cardboard box that was laying on my porch. As it got colder, I ended up lining a cardboard box with another cardboard box, then putting a towel in it for him to sleep on. He spent a good amount of the winter in that box. 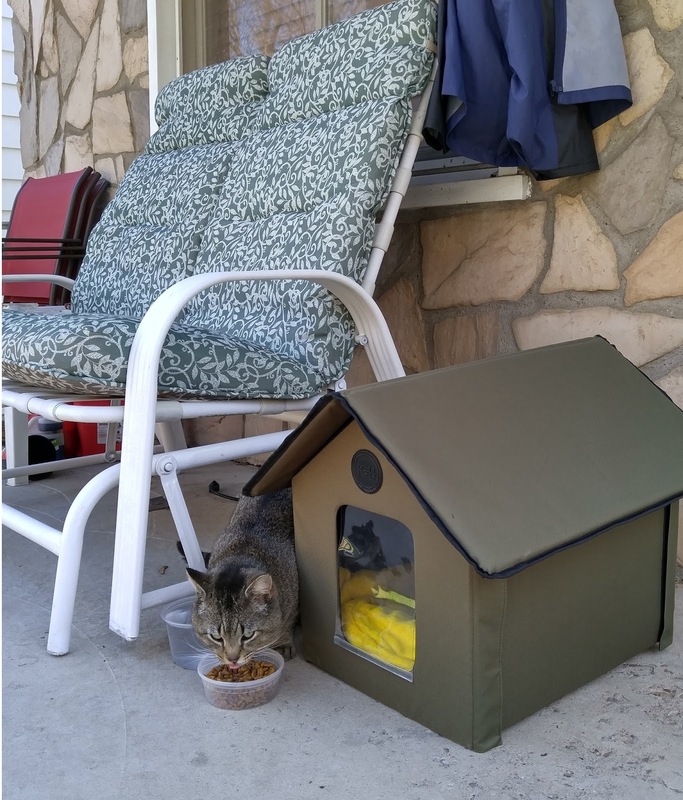 Lars and Buddy became friends pretty quickly, and they started eating their meals together on the porch. Buddy sometimes scratches/meows at the door for Lars to come outside to play, and Lars will knock on the window for me to bring them food. I feel like one of those moms who make sandwiches for all the neighborhood kids. 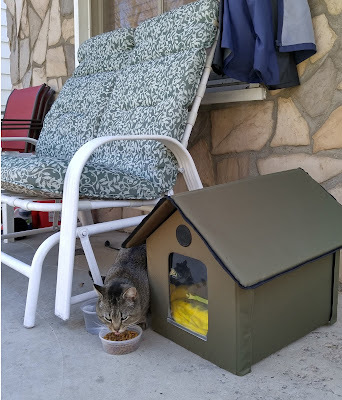 He might be the most spoiled feral kitty ever. Kaylee (yes, she's named after the character from Firefly) is a rescue pup. We've had her since last July, and she's made a ton of progress. 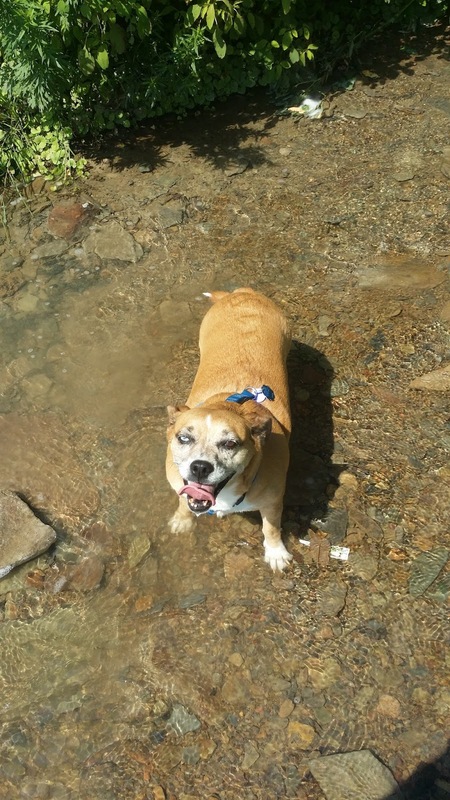 She was rescued from a very abusive situation, so when we got her she was terrified of absolutely everything: being anywhere near a car, other dogs, and most people (especially men). It took a few months and lots of love and walks, but she finally started getting comfortable in her new life. 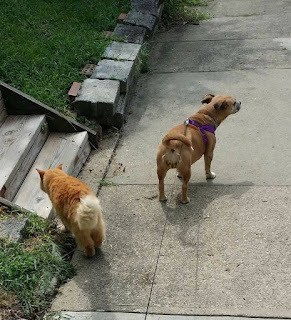 Lars and Buddy walking together in our neighborhood...it greatly amuses the neighbors. 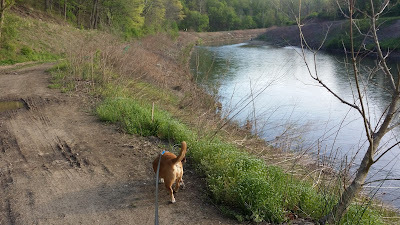 A few months ago she started warming up to people, then I started taking her in the car (in a carrier so she felt safe) to nature trails. Now, not only does she say hello to everyone she meets, she gets mad at me when I don't take her in the car with me. :) A few weeks ago, she started wanting to play with other dogs as well. It's just been awesome to see her transition, and I'm very lucky to have her in my life. Now she pretty much demands to be taken on walks, especially on trails so she can go bye byes in the car. There are a few trails I take her on, and it's always a blast for her, especially when she gets to play in creeks. For me, it's an opportunity to get some fresh air and keep my plant identification skills up-to-date. It's actually helped me greatly as I've been able to watch the natural transition from spring flowers to summer flowers, and I now have a basic timetable of when my characters can expect supplements to their food supply as I've started writing book 3 (which takes place in the spring and summer). Not only that, being out in nature is just a great muse since so much of my stories take place in the woods. No better place to be inspired than next to a creek or on a trail in the forest. Lars getting in touch with nature...or he just REALLY loves sticks. Now that I've totally done the fur mom thing and pushed pictures of my kids upon anyone willing to listen...I must take my leave for now.